Our research group uses a combination of interdisciplinary approaches including synthetic biology, systems biology, microbiology, synthetic chemistry, and nanoengineering to address the key global challenge involving antimicrobial resistance. 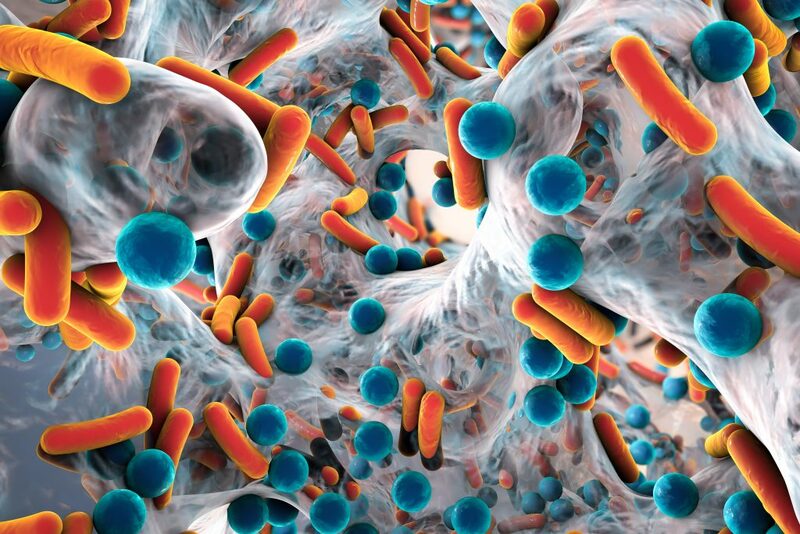 We aim at developing strategies for rationally engineering next-generation smart antimicrobials that can eliminate multi-drug resistant superbugs, with the ultimate goal of creating therapies that can evade evolution of drug-resistance in microbes. To this end, we are also interested in investigating the non-genetic mechanisms responsible for antimicrobial tolerance/resistance to devise strategies that can one day prevent evolution of drug resistance. Using synthetic biology tools we are also interested in designing, constructing and engineering modular synthetic genetic devices based on less-explored naturally occurring mechanisms, for both understanding fundamentally how nature works as well as built devices for potential biotechnological applications. Session 3: Prevention and Therapy Anushree Chatterjee, PhD | University of Colorado at Boulder "From Synthetic Biology to Nanobiotechnology: Rational Antimicrobial Engineering Approaches for Combating Multidrug-Resistant Pathogens"
BBC features our Quantum dot antibiotic research! Battling Bacteria: Back to Square 1? ABC Channel News Features our Light-activated nanotherapy against antibiotic-resistant “superbugs”! Antimicrobial Resistance Mediation OutReach (ARMOR) Program CU Boulder Chapter official website launched! See link. Check out our outreach events! Lab undergraduate researcher Vismaya Bachu wins Silver Medal Award from the College of Engineering! Congratulations!! :) Vismaya will be heading to medical school this fall. Lab receives funding from NASA-TRISH and Lab Venture Challenge! Lab develops a de-novo aggregating antimicrobial peptide and bacterial conjugation based delivery system. CHAOS paper receives significant media press: University of Colorado press release, Phys.Org, Scicasts, Science Daily, Innovation News, Quartz, and more. Toni successfully defends his Ph. D. and becomes Dr. Antoni E. Bordoy! Many congratulations!! Peter's paper "CRISPR gene expression perturbations for enhancing bacterial tolerance to biofuels" published in Frontiers in Biotechnology and Bioengineering. Congrats! Peter successfully defends his Ph. D. and becomes Dr. Peter Otoupal! Peter will move on to his new post-doc position at Sandia National Lab starting in August. Many congratulations Peter! Peter's paper "Multiplexed deactivated CRISPR-Cas9 gene expression perturbations deter bacterial adaptation by inducing negative epistasis" is published in Nature Communications Biology! Congrats! Anushree nominated as "Rising Stars" by the journal Frontiers of Chemistry! Peter wins Excellence in Graduate student research award from ChBE department. Congrats! Will Cordell wins Marilyn and Howard L. Anseth Outstanding Undergraduate Research Award and Outstanding Undergraduate Research Awards ‐Gold medal. Congrats! Kristen and Tom recieve NSF GRFP Honorable mentions. Congrats! Anushree receives ACS Infectious Diseases Young Investigator Award! Anushree becomes Associate Editor of Frontiers in Bioengineering and Biotechnology. Tom's paper "Intracellular hepatitis C modeling predicts infection dynamics and viral protein mechanisms" published in Journal of Virology. Congrats Tom! Tom's paper "Spaceflight modifiesEscherichia coli gene expression in response to antibiotic exposure and reveals role of oxidative stress" is published in Frontiers in Microbiology. Congrats Tom! University of Colorado Health features our research to combat antibiotic resistance! Link to article. Peter wins third place in Stars symposium. Congrats! Lee's paper on "Conformational Smear Characterization and Binning of Single-Molecule Conductance Measurements for Enhanced Molecular Recognition" published in JACS. Congratulations! Keesha's paper on "The Tolerome: A database of transcriptome-level contributions to diverse Escherichia coli resistance and tolerance phenotypes" published in ACS Syn Bio. Congratulations! Colleen's paper on "Potentiating clinical drug resistant bacteria via stimuli-activated superoxide generation" published in Science Advances. Congratulations! Sepideh's paper "Quantum Point Contact Single-Nucleotide Conductance for DNA and RNA Sequence Identification" published in ACS Nano. Congratulations! Colleen moves on to her new post-doc position at Sandia National Lab at Livermore. Congratulations and all the best! Anushree receives grant funding from National Science Foundation! Colleen successfully defends her Ph.D., and becomes Dr. Courtney!! Congratulations!! Colleen recieves Max Peters Outstanding Graduate Student Award. Congratulations! Keesha successfully defends her Ph.D. and becomes Dr. Erickson! Keesha moves on to pursue postdoctoral research at Los Alamos National Laboratory. Congratulations and all the best!! Lee wins NSF Graduate Fellowship. Congratulations! Keesha's paper on "Transcriptome level signatures in gene expression and gene expression variability during bacterial adaptive evolution”published in mSphere. Congrats! Lee's paper titled "Single nucleotide DNA sequence identification using biophysical signatures from nanoelectronic quantum tunneling" published in Small. Congrats Lee! Anushree recognized as one of the most highly prolific authors for ACS Infectious Diseases! Sam Goodman defends his Ph.D. and moves on to a postdoctoral fellow position at the National Academy of Sciences. Congrats Sam! Peter's paper on "CRISPR perturbation of gene expression alters bacterial fitness under stress and reveals underlying epistatic constraints" is published in ACS Synthetic Biology. Congrats Peter! Toni's paper on "Transcriptional Interference in convergent promoters as a means for Tunable Gene Expression" is published in ACS Synthetic Biology. Congrats Toni! Quantum dot antibiotic work highlighted in MRS Bulletin! Quantum dot antibiotic work featured in France's Tech 24 TV show! Vismaya and Pallavi recieve UROP awards to pursue research. Congrats! Keesha recieves NSF-EAPSI Fellowship to conduct collaborative research. Congrats Keesha! Lee recieves GAANN fellowship. Congrats! Sepideh and Sajida join lab as postdoctoral fellows. Welcome! New graduate students Lee, Partha join Chatterjee Lab. Welcome! Keesha wins Dean's Graduate Student Research Grant for discovery of novel drug targets for treating MDR infections. Congrats! Anushree presents five talks on synthetic biology, antimicrobial adaptive resistance, and strategies for novel therapeutics for MDR bacterial infections at AIChE 2015 conference. Our paper featured in the Gram Negative Issue of ACS Infectious Disease! We report novel CHAOS Therapy to Slow down bacterial evolution of antibiotic resistance in paper "Multiplexed deactivated CRISPR-Cas9 gene expression perturbations deter bacterial adaptation by inducing negative epistasis" published in Nature Communications Biology. We report using Quantum dot antibiotics to potentiate antibiotics in highly drug-resistant clinical isolates in paper "Potentiating clinical drug resistant bacteria via stimuli-activated superoxide generation" published in Science Advances. We report a novel Light-Activated Nanotherapy that kills Clinically isolated Multi Drug Resistant Bacteria in manuscript led by Colleen and Sam, "Photoexcited Quantum Dots for Killing Multi-Drug Resistant Bacteria" in Nature Materials! We report a CRISPR gene expression perturbation approach to increase bacterial tolerance to biofuels "CRISPR gene expression perturbations for enhancing bacterial tolerance to biofuels" in Frontiers in Bioengineering and Biotechnology! We report a new mathematical model fitted to experimental data for predicting intracellular HCV dynamics, "Intracellular hepatitis C modeling predicts infection dynamics and viral protein mechanisms" in Journal of Virology! We report transcriptomic signature of E. coli adapted to antibiotics on the International Space Station, in "Spaceflight modifies Escherichia coli gene expression in response to antibiotic exposure and reveals role of oxidative stress." Frontiers of Microbiology! We report the first database that can mine gene expression data sets to identify key players of adaptive resistance in bacteria. "The Tolerome: A database of transcriptome-level contributions to diverse Escherichia coli resistance and tolerance phenotypes." published in ACS Synthetic Biology. We are pleased to report a new systems bology approach to mine and identify key gene signatures in complex gene expression data sets in our publication "Transcriptome level signatures in gene expression and gene expression variability during bacterial adaptive evolution," in mSphere. We are pleased to report four publications on novel single-molecule sequencing methods in 2017! These publications can be found in ACS Nano, JACS, and Small. We present a novel application of CRISPR-Cas9 technology for investigating how gene expression governs the adaptive pathways available to bacteria during the evolution of resistance in Peter's paper titled, "CRISPR perturbation of gene expression alters bacterial fitness under stress and reveals underlying epistatic constraints" in ACS Synthetic biology! We report a novel tool for synthetic biology and metabolic engineering by investigating transcriptional interference mechanisms of antisense roadblock and RNA polymerase traffic in a set of convergent promoters, in paper led by Toni, "Transcriptional Interference in convergent promoters as a means for Tunable Gene Expression" in ACS Synthetic biology! We report a novel gene expression variability based approach to identify important genes involved in bacterial adaptive resistance, in paper led by Keesha, "Gene expression variability underlies adaptive resistance in phenotypically heterogenous bacterial populations" in ACS Infectious Diseases! We report a new mathematical model that describes tunabilty of genetic switch behavior during antisense transcription, in a paper led by Toni, "cis-Antisense Transcription Gives Rise to a Tunable Genetic Switch Behavior: A Mathematical Modeling Approach" in PLoS ONE! We report a bet-hedging based mechanism of adaptive resistance to PNA based antimicrobials in a paper led by Colleen, "Sequence-specific peptide nucleic acid based antisense inhibitors of TEM-1 beta-lactamase and mechanism of adaptive resistance" in ACS Infectious Diseases! We reveal novel nanoelectronic fingerprints for DNA in paper led by Josep, "Measurements of Single nucleotide Electronic states as Nanoelectronic fingerprints for Identification of DNA Nucleobases, their Protonated and Unprotonated states, Isomers and Tautomers," in Journal of Physical Chemistry Letters B! Our lab designs and reports a new FBA tool called CONSTRICTOR, in a paper led by Keesha, "CONSTRICTOR: Constraint modification provides insight into design of biochemical networks" in PLoS ONE! Sam's paper "Multiple Energy Exciton shelves in Quantum Dot-DNA Nano-bioelectronics" is published in The Journal of Physical Chemistry Letters! Our mathematical modeling paper on "A pharmacokinetic/viral kinetic model to evaluate treatment of chronic hepatitis C virus with danoprevir" accepted in Antiviral Therapy! Anushree's paper on "Antagonistic self-sensing and mate-sensing signaling controls antibiotic-resistance transfer" is published in PNAS!